Email lead capture is the process marketers use to collect information from their website visitors. Typically, this is done through a traditional web form, although you can also capture leads through popups, chatbots, live chat, quizzes, surveys, and more. Despite the process being fairly straightforward, our strategies often fluctuate in how we accomplish lead capture. Similarly, the results we achieve can vary quite a bit, too. Unfortunately, the diversity of lead capture strategies, tools, and results can make it difficult to know precisely which process you should follow with your own marketing team — which is why we decided to conduct a survey. We wanted to see, in 2019, what tools marketers are using for lead capture, what strategies they are using to optimize their efforts, and what kind of results and conversion rates people are seeing. To ensure you’re able to optimize your lead capture strategy in 2019, keep reading. Any survey you conduct is limited by the sample you can reach. In our case, we received 173 valid survey responses. We filtered for marketers working full-time on lead capture and lead generation. Here are some quick statistics about our sample. Additionally, a good chunk of our respondents (24%) work in advertising and marketing, but the rest is fairly diverse and split evenly between other industries. Everyone in our sample works full-time and said they were “very” or at least “somewhat” involved in lead generation and lead capture efforts at their companies. As with any research you conduct, there are some limitations with our dataset, as well. We’ll cover sample limitation and quirks later in this article. Forms aren’t dead. 74% of marketers are using web forms for lead generation, and 49.7% of marketers say that web forms are their highest converting lead generation tool. Chatbots still have low adoption, but still, 17% of marketers are using chatbots today. However, only 6.5% say its their highest converting lead capture tool. The average length of a web form in 2019 is about 5 form fields. Because contexts vary so wildly, this is neither good nor bad, though we have seen in consistent studies that fewer form fields usually result in higher conversion rates. Conversion rates are highly variable and contextual. Reported conversion rates varied consistently across reported categories, but the mean conversion rate from our study is 21.5% (*read more below about the limitations with our reported conversion rates). Data-driven marketers are outpacing everyone. Running A/B tests, using form analytics, and running user tests are all correlated with higher form conversion rates and satisfaction with lead generation efforts. Multi-step forms convert 86% higher. Only 40% of marketers use them, but those that do report 17% higher satisfaction rates with their lead generation efforts, and their self reported conversion rates are 86% higher. Only half of marketers use “lead magnets” to capture email addresses. Marketers who use lead magnets, or downloadable resources after a website visitor shares their email address, report marginally higher satisfaction rates and conversion rates than those who do not use lead magnets. Ebooks are the most popular lead magnet, with 27.7% of marketers using them. However, 24.9% are using webinars and almost as many (21.3%) are using free tools to get email addresses. The average Ebook length is between 5k and 10k words. Barely anyone writes an Ebook that is larger than 10,000 words, and the most common length is between 5,000 and 10,000 words. Marketers overemphasize on total lead volume and not enough on lead quality. It’s reported that only 56.4% of marketers have a lead qualification strategy, and only 39.5% are using any sort of predictive lead scoring. It appears we overemphasize on volume on leads without considering the quality of each lead. Now that we’ve covered that, let’s explore a few of these statistics more in-depth. Takeaway #1: Forms aren’t dead. Online forms are the most commonly used type of lead capture tool, with 74% of respondents reporting they use them. Half of our respondents reported forms gave them the highest conversion rates, making online forms the highest-converting lead capture tool for marketers. Takeaway #2: Chatbots still have comparatively low adoption. 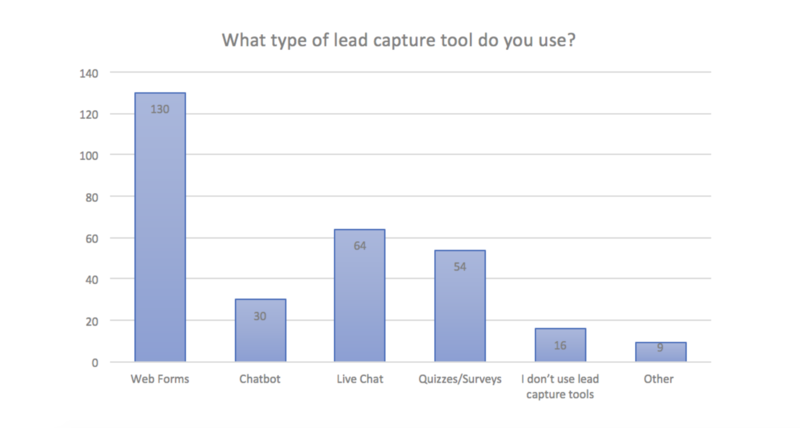 Many marketers report using more than one type of lead capture tool, but roughly 40% report only using one tool. And, while 37% of respondents use live chat, only 17% use a chatbot. Additionally, only 7% of respondents said chatbots were their highest converting tool. By comparison, around 13% reported live chat or quizzes/surveys being the most effective tool. It would appear from this data that, despite hype and trends, the old school web form is still alive and well for marketers. Takeaway #3: The average length of a web form in 2019 is about 5 form fields. Forms are popular and pretty well loved in 2019, but what does the average form look like? For starters, we found that marketers use, on average, 4.92 form fields on their forms (with five being the most popular answer). The number of form fields mostly resembles a normal distribution that centers around five, although there is a small spike of marketers who use more than 10 form fields. Takeaway #4: Conversion rates are highly variable and contextual. Average conversion rates are pretty varied, with a pretty stable distribution of reported conversion rates. Very few people report conversion rates in the 51-100% bucket. This is one piece of data we need to take with a grain of salt, as with any self-reported KPI or metric. We don’t know exactly how our respondents define a conversion, how they measure conversion rates, or what their offers are, so we lack a lot of context. Still, when we couple our conversion rate data with our data on self-reported satisfaction rates, we start to see interesting patterns. 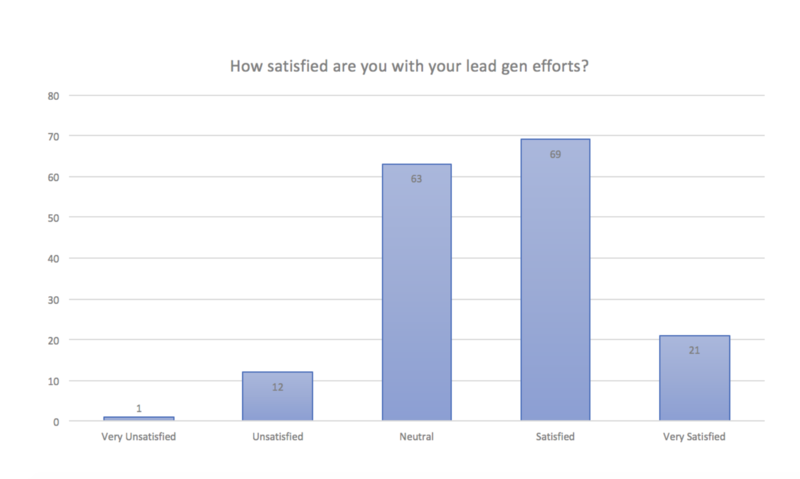 Very few people (8%) are dissatisfied with their lead generation efforts, but only 12% report being very satisfied. It also gets interesting when you examine these answers in conjunction with others. For instance, we found that those who are most satisfied with their lead generation efforts are those who use chatbots and report chatbots as their top converting lead capture tool. Takeaway #5: Data-driven marketers are outpacing everyone. Generally speaking, marketers who use methods to improve the customer experience, and specifically those who are using data to drive experiences, are outperforming those who don’t. For instance, marketers who run A/B tests on their forms tend to be more satisfied than those who don’t, and they also report roughly 10% higher conversion rates than those who don’t run A/B tests. Following the trend, those who use form analytics report 15% higher satisfaction with their lead generation efforts and 19% higher conversion rates. But what about user testing? A user test is a type of usability test in which you have users run through your website and attempt a task, and analyze their ability to do so. Most people are running between one and five per year, but a full 36% never run user tests on their forms. Again, we found that people who run user tests are more satisfied with their lead generation programs than those who don’t, and that the satisfaction rating increases as the number of user tests rises. This is a big area of opportunity. Combined with a form analytics tool like Formisimo, you can learn a lot about user behavior from occasionally running user tests. To learn more about form optimization in general, check out this CXL Institute course. Takeaway #6: Multi-step forms convert 86% higher. Only 39% of marketers report using multi-step forms. Those who do, however, report 17% higher satisfaction rates with their lead generation efforts, and their self reported conversion rates are 86% higher (16.05% for those who don’t use multi-step, and 29.76% for those who do). A small majority of marketers report using lead magnets in their campaigns, but 40% report not using them at all. Takeaway #7: Only half of marketers use “lead magnets” to capture email addresses. A lead magnet is simply something of value you give in exchange for a visitor’s contact information. We found that a small majority of marketers use lead magnets to capture emails, but a full 40% don’t use them (and roughly 10% don’t know if they are or aren’t). Creating a relevant and valuable lead magnet is one of the most effective ways to increase conversion rates on lead capture forms. If you’re not doing this, it might be time to consider trying it out. Takeaway #8: Ebooks are the most popular lead magnet. If you’re wondering what type of lead magnets people generally use, Ebooks lead the way — but webinars, checklists, and free tools are close behind. Other answers included “Qualifying email lists”, “Rewards”, “Customized vehicle brochure”, and “Property information”, meaning it’s largely made up of industry-specific offers that are related to the product or service in question. Takeaway #9: The average Ebook length is between 5k and 10k words. Very few marketers create Ebooks with greater than 10,000 words, and most fall within the area of 5,000-10,000 words long. Takeaway #10: Marketers overemphasize on total lead volume and not enough on lead quality. Collecting a lead is a small part of the overall process. It’s important, of course, but you also need to worry about where you’re storing the data, and how you’re qualifying and nurturing leads. Most marketers use more than one tool to store their leads — something that definitely jives with my personal experience. Because we’re often using a myriad of tools for our marketing efforts, we need to store leads in many places and integrate many systems together to build a coherent system. Specifically, we found that the most common tool for lead storage is a CRM, with 57% of marketers reporting using one. 48.8% report using an email marketing tool for storage, and 43.6% report using spreadsheets. Of course, capturing leads is just one step of the process. What we do with them matters as well, as the end goal isn’t just to store them in a CRM or an email tool, but to turn them into customers. Part of this approach is qualifying leads and reacting appropriately based on their quality. Do marketers normally have a strategy for lead qualification? It appears that, yes, this is the norm, with 56.4% of marketers saying they do have a documented lead qualification process. However, that leaves 34.9% with no documented process. This is important because, as you would logically suppose, those who have a documented lead qualification process report 21.4% higher satisfaction ratings with their lead generation efforts. While 39.5% of marketers are using predictive lead scoring in their marketing strategy, roughly half of marketers (48.8%) are not (and 11.6% don’t know if they are or not). As with any collection of data, you need to question its quality thoroughly. Especially with surveys and self-reported data, the nature of the questions can affect the output of answers. In our case, we can draw a lot of valid insights about lead generation and marketing in 2019, but we need to be careful about generalizing some of it. The big question we need to consider is the “average conversion rate” of lead capture forms. Naturally, this depends on how you calculate conversion rates, where your web form is, what your offer is, etc. For instance, the conversion rate of an offer for a free tool that is only seen by targeted paid traffic and only has an email address field is entirely different than a pop-up form that everyone on an ecommerce site sees. Ultimately, conversion rates are wildly contextual. How people calculate conversion rates is also different. Do you calculate by those who see your form, those who count as a page view (despite not scrolling to the form), or those who start filling out the form but never finish? None of this is straightforward, so it can be tough to generalize findings about this metric. Our respondents seem to get better and better conversion rates the more form fields they use. While this is possible, it’s incredibly unlikely, at least when all other variables are controlled for. Almost all historical research has shown that increasing the number of form fields has an inverse effect on conversion rates (although not all studies have shown that). That’s not to say the data is inherently untrustworthy. Just take any “average conversion rate” data with a grain of salt! Additionally, we believe our sample is quite representative, as it had been filtered to include only those who work full-time on lead generation and lead capture efforts. But a greater sample would have been desirable. There is a lot of nuance — in industries, company size, etc. — that we couldn’t dive into because our sample size was only 173. The process of capturing email leads is a huge part of inbound marketing. Parts of it change over time, such as the lead capture tools we use and the specific tactics around lead magnets, form optimization, and lead scoring and storage. However, much remains the same, such as the core ideas of crafting relevant offers and building a lead capture tool with as little friction as possible. It appears from this survey that less has changed than one would expect. Despite new “conversational” tools like live chat and chatbots, most people still use forms, and most people still entice visitors with Ebooks and webinars. To no one’s surprise, those who run A/B tests, conduct user tests, and use form analytics, are more successful than those who don’t. It will be interesting to see how things change in the next few years, as inbound marketing channels become more crowded and lead capture tools get “smarter” and more interactive. Will we still be writing 7,500 word Ebooks in exchange for five form fields’ worth of information? That’s where we stand today. Where will we be next year?